Netflix has been shoring up its animated children’s programming for some time, acquiring a hit-and-miss roster of film spin-offs, a pair of Lego tie-ins, and updates of familiar properties. A revamped version of the long-running spy spoof Danger Mouse adds some global appeal to the lineup, taking a classic brand name from the U.K. and rebooting it for today’s audiences. The original adventures of “the greatest secret agent in the world” (or so goes the theme song) make for a dated but likable bit of limited animation, heavy on wordplay and absurdist bits of plotting. (Despite a background in international espionage, the Danger Mouse of the 1980s sure dealt with a lot of extraterrestrial threats.) The reboot is more “modern” in a wacky, Looney Tunes fashion, and the new look and feel works for the show, albeit in a generic way. The new Danger Mouse most resembles Darkwing Duck, minus the quirky familial backbone. Like that Disney Afternoon staple, Danger Mouse presents its title character as an action-obsessed, heroic-but-reckless egomaniac, as opposed to the silly-yet-debonair spy from the old series. It’s a change that diehard fans may not like, but it fits the more energetic, elastic vibe of the current show. For all the nostalgic love of the original, it’s hard not to note its glaring faults (especially its bland villains), and the reboot ensures all of its characters, even minor ones, fit into the new show’s world. But the dry wit and acerbic wordplay is missing, replaced by broader, dumber gags and physical comedy. It doesn’t go too far overboard (although later episodes tend to rely on a lot more toilet humor than needed), making for a funny, entertaining show—although it’s hard to tell if the writers will really push the show in any way. The series begins on a strong note, with a premiere that thematically bridges the old Danger Mouse and the new. Meta humor has always been part of the property’s DNA, and the question of whether or not Danger Mouse (Alexander Armstrong) is “relevant” in this day and age is the perfect plot for the character’s comeback. After an elaborate opening action sequence (including, appropriately, a battle with an alien craft), London is laid to waste and Danger Mouse is fired. With the money that would typically fund his exploits reallocated for the city’s reconstruction, he takes a series of odd jobs while world-saving duties are handled by an army of mechanized “Safety Mouses.” There’s a comic warmth in watching Danger struggle with his cravings for action while performing mundane tasks, and subsequent episodes include similar dashes of drama to prop up their outlandish action and ridiculous gags. The Safety Mouses, meanwhile, set the stage for the return of Baron Silas Von Greenback (Ed Gaughan), much more dynamic here than in his previous incarnation. 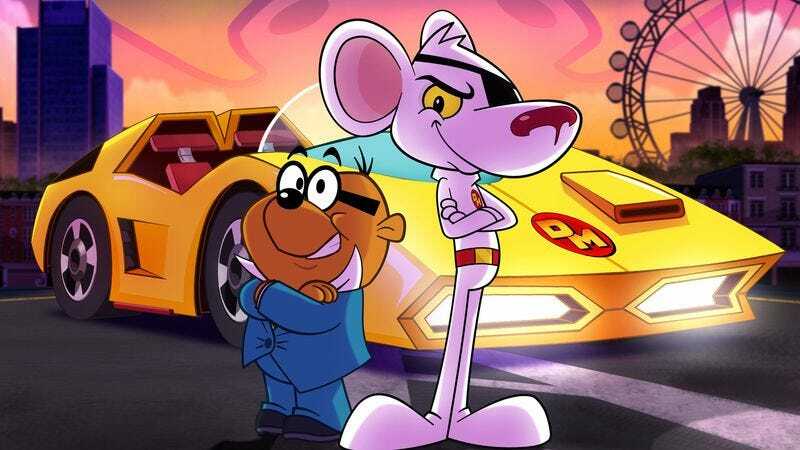 The series maintains the most important aspect of the original: The rapport between Danger Mouse and his goofy, ineffectual sidekick Penfold (Kevin Eldon). Not only do Armstrong and Eldon sound like their predecessors, but they also keep up with the new show’s frantic energy. Much of the humor is derived from Penfold’s cowardice, juxtaposed against Danger Mouse’s inability to recognize what danger even is. Their boss, Colonel K (Stephen Fry), proves the weakest link in the cast of characters. Not that Fry does an inadequate job, it’s just that the early episodes relegate the colonel to the role of bumbling authority figure. It’s a new character, Professor Squawkencluck (Shauna Macdonald), who makes the biggest impression. She’s more or less the show’s “straight man,” but also one of the few female characters who’s able to go toe-to-toe with Danger Mouse himself (ditto the vibrantly tressed Jeopardy Mouse, voiced by Lena Headey), and the back-and-forth antagonism between them is one of the reboot’s comic highlights. The cast’s capabilities bolster the show’s bright color palette, and Robert Cullen’s direction is wonderfully lively, particularly in the intro. However, sometimes the animation can’t quite match the ambition of the action attempting to be portrayed on screen. Balancing physical comedy with potent action is a difficult assignment, and for the most part Danger Mouse delivers. It’s fun, funny, and visually sharp, but it isn’t the kind of show that seems interested in expanding its world or spending too much time satirizing modern British culture. And that’s not necessarily a bad thing: Lots of animated shows thrive on the virtues of game characters and abject lunacy. 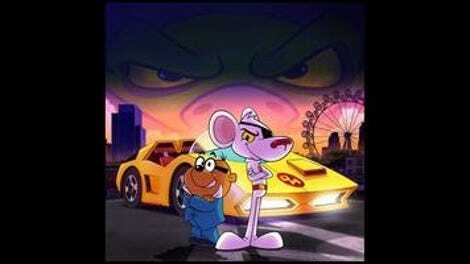 Watching Danger Mouse is a fun trip down nostalgia lane, but feels as essential as, well, any reboot made these days.